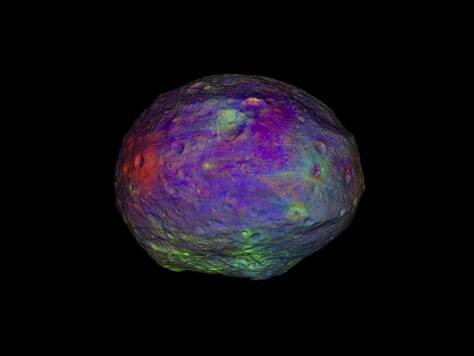 This animation of Vesta is made from images taken with Dawn's framing camera. Many of the images were taken at different viewing angles to provide stereo for use in determining the topography. Other images were taken through special infrared and visible light filters in the camera. These infrared and visible light images have been combined and represented in colors that highlight the nature of the minerals on Vesta's surface. Green shows the amount of iron. Scientists have not yet determined the composition indicated by the other colors.